The centre cut taken from the crown of the Smoked Salmon fillet. 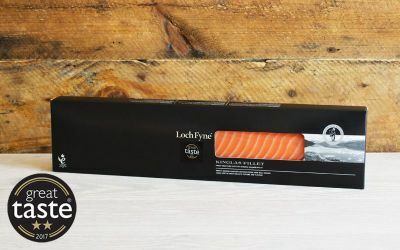 Fresh Scottish Salmon fillets are cured with brown sugar and sea salt, then gently smoked over oak shavings from retired whisky casks, dressed with beetroot for a subtly sweet flavour with earthy undertones and a deep red velvety colour. This product is ready to consume without cooking. Remove from pack 10 minutes before serving to release the full flavour of our Beetroot Smoked Salmon. Delicious served with apples, walnuts and celery or with a dill yoghurt to compliment the sweet yet earthy flavour. Scottish Farmed SALMON (FISH) (Salmo salar) 95.6%, sea salt 2.8%, Beetroot Powder 0.8%, sugar 0.8%.